Rewinding the musical clock to a time when cocaine and reefer were legal, cultural dynamism was at a peak, modern womanhood was redefined and the first sexual revolution was under way, Sugar Bowl Hokum perform songs that draw on these themes. 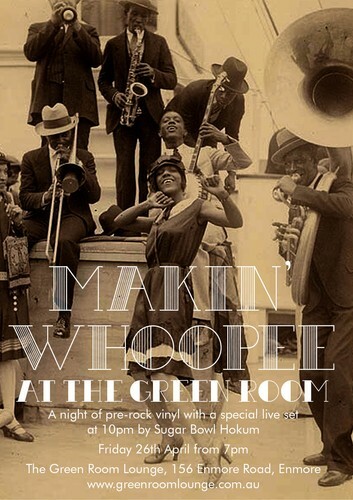 Once a month the Green Room Lounge puts on a night called Makin’ Whoopee where resident record spinner Nicholas J. Dalton plays the ye olde music from the 20s to the mid 50s and special like-minded live acts join in on the proceedings. The music, on vinyl, stretches back to King Oliver and the jazz bands of the 1920s, blues, bee bop, Hank Williams, the Big Band era, Duke Ellington, jump blues, swing right through to the early seeds of rhythm & blues and rock & roll. A live performance by Sugar Bowl Hokum will entertain you with tales of natural disaster, drug addiction, sexual promiscuity, broken hearts and lost love are all covered in the tunes chosen by the band. These mostly date from the 1920s and 30s. The music of some very feisty almost forgotten trail blazers makes up a large part of the repertoire. Memphis Minnie, Barrel House Annie, Rosetta Howard and Bessie Smith songs are performed in different arrangements than the listener may not be used to but always capturing the essence of the song and the times. Comprised of PK on double bass, Mino Tramacere on percussion, Michael Meissner on acoustic guitar, ukulele and harmonica, and Cassandra Woodfield on vocals and kazoo, their intimate sound is bluesy, ragtime with some early jazz overtones.